Zoetje Aucamp has been breeding Golden Retrievers for 17 years. She also breeds Labrador Retrievers. 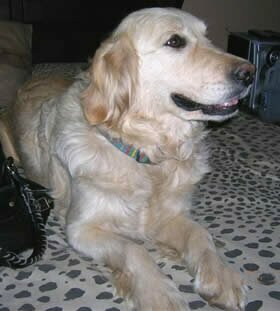 Best known for their intelligence and ability to work as guide dogs for the blind and as helper aid dogs, Golden Retrievers are one of the most popular family dogs as they are easy to handle, very tolerant, and normally very happy and friendly. They are low-maintenance dogs and thrive on attention, regular exercise, a balanced diet, and regular veterinary check-ups. Golden retrievers are wonderful companions and excellent with children. Golden Retrievers vary widely in colour. The coat is dense and waterproof, and may be straight or moderately wavy. It usually lies flat against the belly. The coat may be described as "a rich, lustrous golden of various shades", excluding coats that are extremely light or extremely dark. Therefore, "pure white" and "red" are unacceptable colors for the Golden coat. The Golden's coat can also be of a mahogany color, referred to as "redheads". As a Golden grows older, its coat can become darker or lighter, along with a noticeable whitening of the fur on and around the muzzle. Puppy coats are usually much lighter than their adult coats, but a darker colouration at the tips of the ears may indicate a darker adult color. 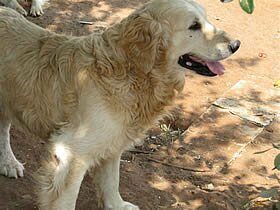 The Golden Retriever temperament is a hallmark of the breed and is described as "kindly, friendly and confident". They are not "one man dogs" and are generally equally friendly with strangers and those familiar to them. Their trusting, gentle disposition therefore makes them a poor guard dog. The typical Golden Retriever, is calm, naturally intelligent and biddable, with an exceptional eagerness to please. They are excellent with children and this along with their other qualities has made them a favorite family pet. As the name suggests, the Golden Retriever loves to retrieve. Whether it's a thrown stick, tennis ball, or flying disc, retrieving can keep a dog of this breed occupied and entertained for hours, particularly if there is also water involved. Goldens are also noted for their intelligence, and can learn up to roughly 240 commands, words and phrases. These dogs are also renowned for their patience with children. However, as with any breed of dog, if not appropriately trained and supervised, a Golden may accidentally injure a child in play, due to their high-spirited nature. Typically, Goldens are fairly unruly as puppies and may chew and retrieve everything in sight. By the time they reach maturity however, Goldens will have become active and fun-loving animals with the exceptionally patient demeanor befitting a dog bred to sit quietly for hours in a hunting blind. Adult Golden Retrievers love to work, and have a keen ability to focus on a given task. They will seemingly work until collapse, so care should be taken to avoid overworking them. 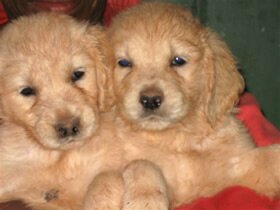 Golden Retrievers are compatible with children and adults and are good with other dogs, cats and most livestock. Golden Retrievers are particularly valued for their high level of sociability towards people, calmness, and willingness to learn. 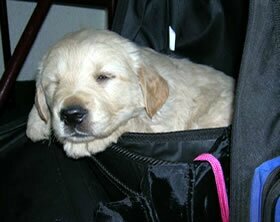 Because of this, they are commonly used as guide dogs, mobility assistance dogs, and search and rescue dogs.